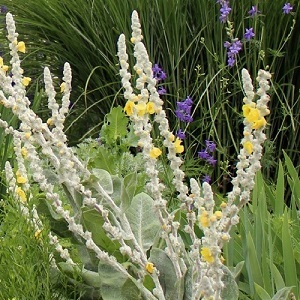 A lovely Verbascum with silver-white leaves and lemon-yellow flowers on tall stalks from June to August. A very adaptable plant for the borders, island beds and Mediterranean/dry gardens, adding height and architectural drama. Plants form a silver rosette of leaves in the first year and flower in the second up to a height of 2m. They attract butterflies and bees into the garden. Looks great underplanted with Lychnis Alba. Verbascum ‘Polarsommer’ grows best in full sun and a well-drained soil. They are drought tolerant once established and cold tolerant. Pack of approx 300 small seeds. Sow in spring to summer. Plant out in the autumn for flowering the following summer. Plants self-seed once established. Sowing instructions and a colour photo are printed on the packet. Sow Sow the seeds from spring into summer. Sow these small seeds sparingly onto the surface of a tray of seed compost. Press the seeds into the compost and do not exclude light, which helps germination. Keep the tray at room temperature (15 – 20 degrees Celcius) and germination takes 2-4 weeks. Pot on the seedlings and plant into their final position in summer to autumn.